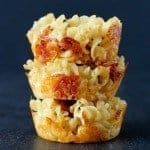 Kids and adults will both love these Pizza Mac and Cheese muffins — two of your favorite treats, macaroni and cheese and pizzas, rolled into one cute package. What could be better? This isn’t my first go-around with turning macaroni and cheese into a muffin so that you can eat it with your hands. (Been there, done that….please refer to southwest macaroni and cheese muffins) It’s obviously one of the best things ever. 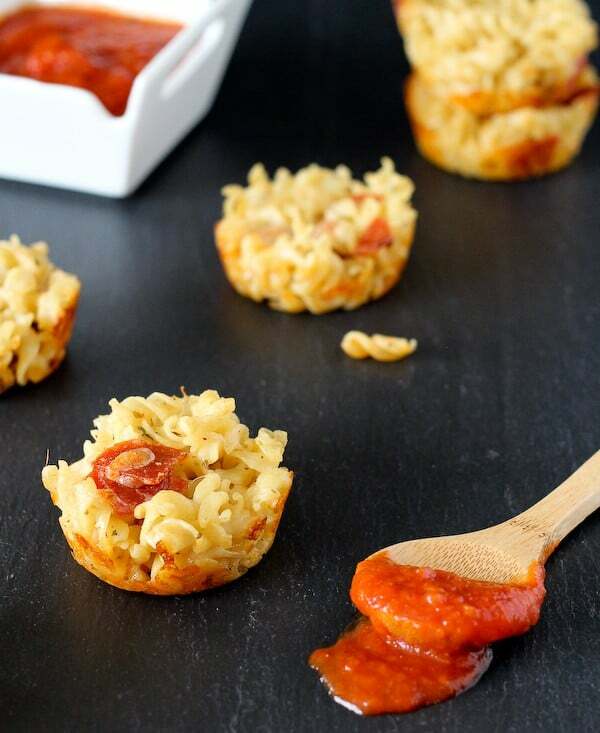 Macaroni and cheese….that you can eat with your hands. Are ya with me? Throw in the word “pizza” and I’m totally sold. Oh but the kids. Oh yeah. That’s right, I made these mac and cheese muffins for the kids. Uh….hmmm…yeah. For the kids. The apple doesn’t fall far from the tree. Now I just have to get myself a sweatshirt with a cupcake on it. It’s obviously I’m on a pizza kick lately (pizza, mac and cheese, I’m the picture of healthy) — a couple of weeks ago I made pizza lasagna rolls (make those.) and then there are my pizza quinoa stuffed peppers. 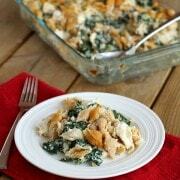 An older recipe, but one of our favorites. What can I say, I love pizza. Stir in a couple of extras (pepperoni! mozzarella! herbs! 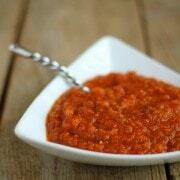 ), scoop into muffin tins, bake, let cool a bit, dipdipdip in pizza sauce and chow down. If you need help with that, you can refer to the photos of E. She was pretty darn good at that step. Enjoy these! They are super fun and would be a cool appetizer for a party. 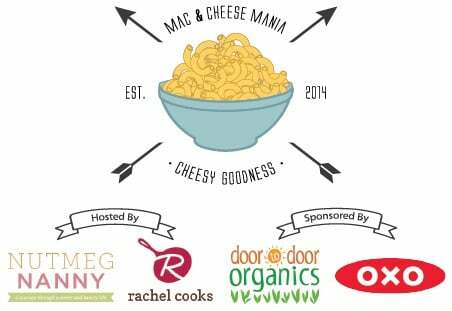 Make sure to head over to Mac and Cheese Mania t0 see what prizes are up for grabs and find out how easy it is to enter to win! 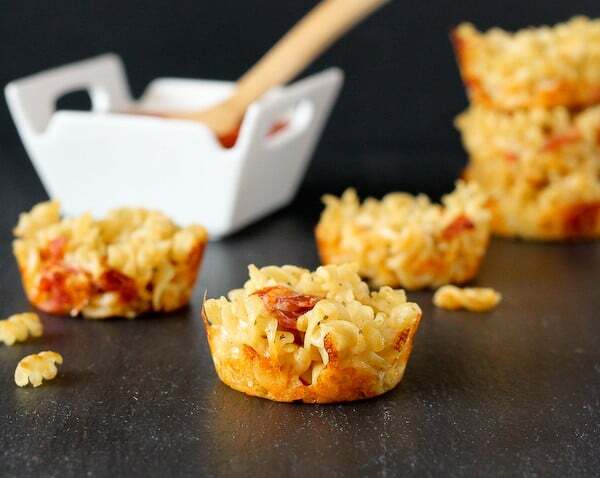 Kids and adults will both love these Pizza Mac and Cheese muffins — two of your favorite treats, macaroni and cheese and pizzas, rolled into one cute package. Preheat oven to 350 degrees Fahrenheit. Spray 12 muffin tins with nonstick spray. Prepare macaroni and cheese as directed on the box, except stir in oregano and garlic powder in addition to the cheese powder. Once prepared, remove from heat and stir in grated mozzarella cheese and pepperoni. 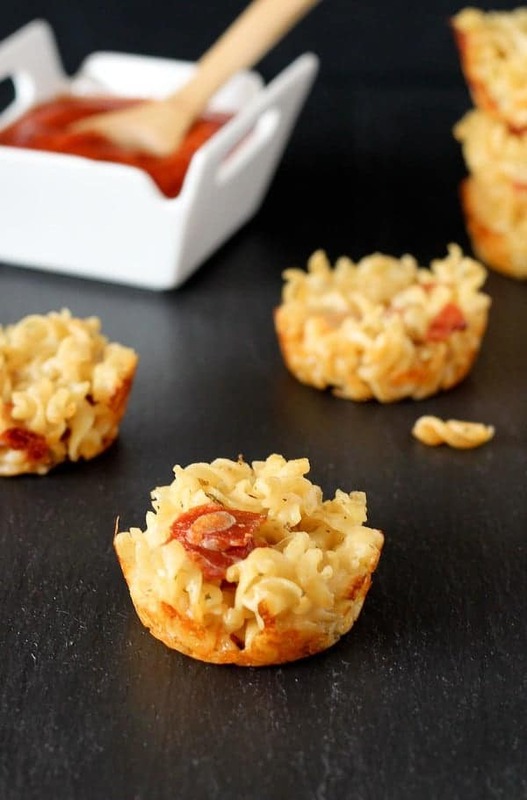 Spoon macaroni and cheese mixture evenly into prepared muffin tins. Bake for 17-20 minutes or until golden brown around the edges. Cool for at least 5 minutes before removing from the muffin tins. After I removed them, I placed them on a sheet of paper towel just to remove some of the grease from the pepperoni. But that is optional. Verdict: We all loved these. Obviously. Shall we review? Pizza. Mac and Cheese. No fork required. I have never been more angry with you! Couldn’t you have posted this recipe BEFORE I made my meal plan for the coming week?! How am I meant to cope without these in my life now? Seriously though these look totally gorgeous, and I’m pencilling them in for the near future. I am a Mac n Cheese lov-ah. So I’m so loving this series. This recipe would be the perfect Friday Family Movie Night dinner… and I can’t wait to make it. Great great idea!!! How cute are these?! 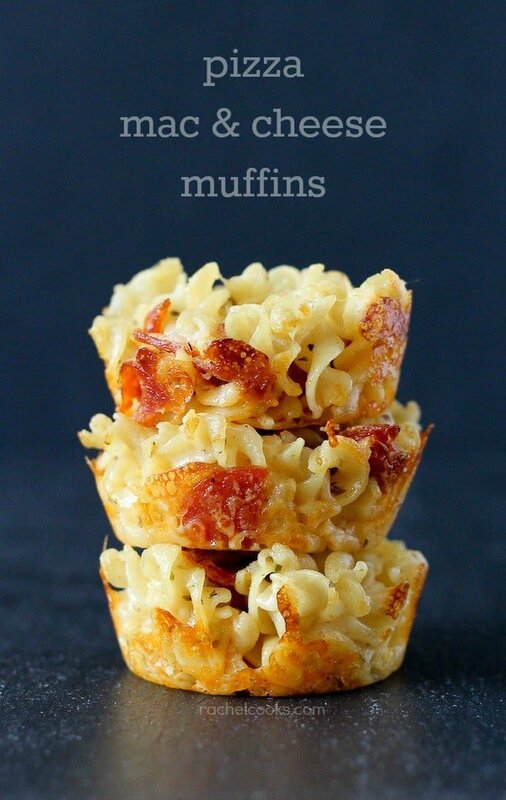 These look so good…I would especially love the crispy, cheesy edges! How stinkin’ cute are these little muffins? I love pasta, I love cheese, I love pizza, I love muffins. All around win! I love the idea of eating mac and cheese with your hands. This would be a great to-go snack. The fact that this is pizza mac and cheese makes it even better. What an adorable shirt. What a fun treat for parties! 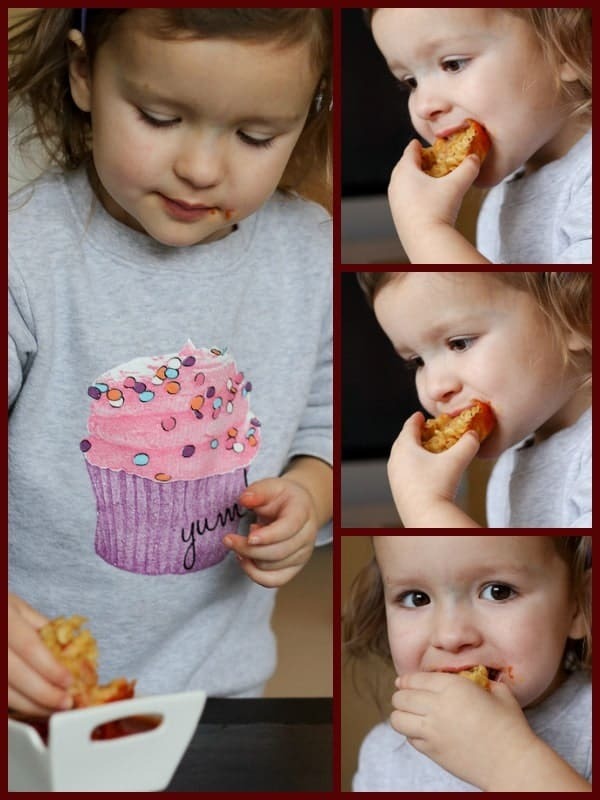 Mac ‘n cheese muffins are so kid friendly… if the adults don’t gobble them all up first! Holy smokes! I could definitely eat something like this every day! So fun! I could down 17 of these, no problem. LOVE these!! A no-fork-required pizza mac and cheese? DONE AND DONE. You are my hero. Also, I want to steal your babe’s shirt. SOCUTE. 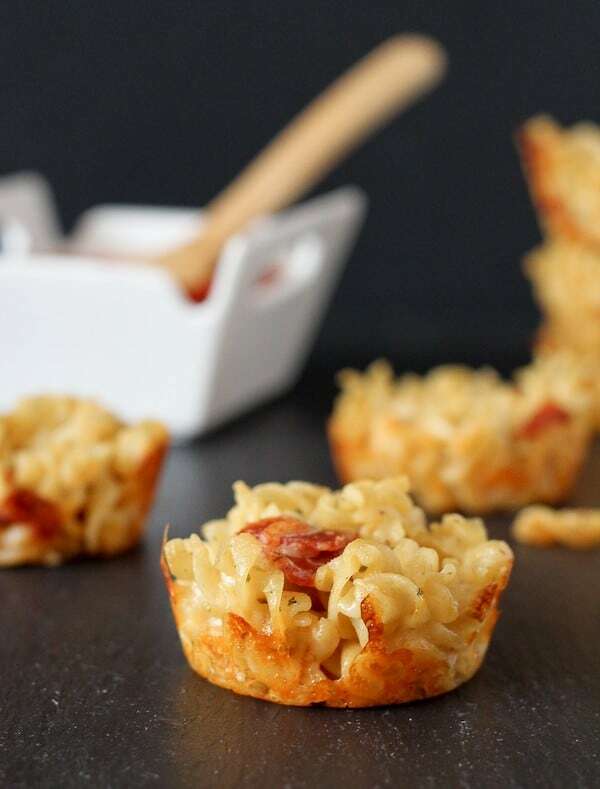 I love that these bites are transportable and that it’s a combo of 2 things I love-pizza and mac n cheeeese!!! Just saw these on FG. STUNNING images and what a super fun & cute idea! Pinned! Thanks so much for sharing Averie! I do try to steer away from packaged food for the most part but I also have two little ones at home so sometimes I fall back on high-quality packaged foods such as Annie’s macaroni and cheese for convenience and speed reasons. All week I presented mac and cheese recipes though if you’re looking for something from scratch there is plenty to choose from! Thanks for reading! These are adorable, any kid would love them!!! I made these last night and my husband and I both loved the recipe. Question, though…my muffins didn’t hold their shape and were a big gooey mess (even after I popped them back in the oven for more time). Do you think it would help to add an egg as a binder or would that change the flavor? Regardless of the gooey pile, we loved the flavor. Thanks! Did you let them cool a bit before eating? You need to do that to let the cheese kind of set back up. They are on the fragile side – but we were able to pick them up and eat them with our hands. I think the addition of an egg is a great idea if they aren’t holding together, though. We let them cool the suggested 5 minutes but couldn’t stand to wait any longer. Lack of self control was probably my problem. My 6 year old will love these. I’ll be making a bunch of these next weekend, perfect lunch for school. Pinned. Where can you purchase the package of Annie’s? Have never seen this brand. Is there something that could be used as a substitute? Thank you. I find Annie’s at my local Kroger and I’ve seen it at lots of grocery stores. If you can’t find it, you can substitute with another boxed macaroni and cheese — look for parmesan if you can find it, or white cheddar. Made these for a party and they were a hit! I followed the exact instructions but just doubled it and there were no leftovers. i believe the butter parm flavor is impt to ensure it doesn’t taste bland. 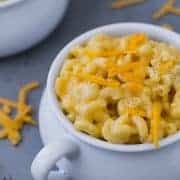 Has anyone tried this w regular cheddar Mac and cheese? Hi Rachel! Love this, but most importantly, I’m going to need to know where you got those little white sauce dishes. Cutest things I’ve ever seen in my life. Thanks! OH man, I wish I could remember! I bought that dish probably over four years ago. My most common places to buy props/dishes are CB2, HomeGoods and Target. Sorry I can’t be of more help! If you buy the mini pepperoni, then you don’t need to cut anything up. Just sayin’ cause these are so totally cute! They would be great for when my mom goes knitting. They meet at a ladies house or a knit shop and everyone brings something. We would have to double or triple it since I’d want some left home for me (I don’t knit so I don’t go). Can’t wait to make this one too! Yes! I love those mini pepperoni! Hope you love these!